1Qasem Abu Harb is Director of the Archive Centre of the Arab Studies Society in Jerusalem (al-Quds). 2Ali Ait Kaci has been working as an archaeologist at the National Archaeological Agency of Algeria since 1990. He has directed many excavations in Italy, Tunisia and Morocco. His current research focuses on Libyco-Berber epigraphy. 3David G. Anderson is professor of anthropology at the University of Aberdeen. He has authored and edited numerous books on Siberia. 4Peter Baldwin is Co-founder of the Arcadia Fund and the Global Distinguished Professor at New York University’s Center for European and Mediterranean Studies. His research focuses on the development of the modern state, but also addresses the comparative history of the welfare state, social policy, and public health. 5Anne K. Bang is Senior Researcher at the Chr. Michelsen Institute and an Associate Professor of African Islamic history at the University of Bergen, Norway. She has published widely on Islam in the Indian Ocean during the nineteenth and twentieth centuries. 6Mohammed Bashir Salau is Associate Professor of history at the University of Mississippi and author of The West African Slave Plantation: A Case Study. 7Mikhail Semenovich Batashev is Senior Research Fellow in the Division of Archaeology and Ethnography of the Krasnoyarsk Territory Regional Museum. 8Stefano Biagetti holds a Marie Curie Intra-European Fellowship in the Department of Humanities, Pompeu Fabra University, where he is conducting research into the resilience of central Saharan pastoralists from historical to current times. 9Courtney J. Campbell is a Past & Present Postdoctoral Fellow at the Institute of Historical Research at the School of Advanced Study, University of London. Her work focuses on international cultural exchange and regional identity in the Brazilian Northeast. 10Craig Campbell is Assistant Professor in the Department of Anthropology at the University of Texas at Austin. His book Agitating Images: Photography Against History in Indigenous Siberia was published by the University of Minnesota Press in 2014. 11Anthea Case is Principal Adviser of the Arcadia Fund and Chair of the National Trust East of England Regional Advisory Board. She was previously Chief Executive of the National Heritage Memorial Fund and Heritage Lottery Fund (1995-2003). She was awarded a CBE in 2003 for services to heritage. 12Dr Graeme Counsel is a Lecturer in ethnomusicology and an Honorary Fellow of the Melbourne Conservatorium of Music, University of Melbourne. His research specialises in the investigation of cultural policies in Africa, examining the nexus between politics and the arts and exploring the ways in which cultural policies shape cultural expression. 13Victor Denisov is a linguist specialising in Finno-Ugric Languages. He is a researcher at the Udmurt Institute for History and a member of the Kastren Finno-Ugric Society, Finland. 14Tjeerd de Graaf has specialised in the phonetic aspects of ethnolinguistics. After retiring from the University of Groningen, he was a visiting professor at the University of St. Petersburg and guest researcher at the Slavic Research Center of Hokkaido University, Japan. He is a research fellow at the Frisian Academy and a board member of the Foundation for Endangered Languages and the Foundation for Siberian Cultures. 15Savino di Lernia teaches ethnoarchaeology and African archaeology at the Faculty of Letters, Sapienza University of Rome. He is the director of the Archaeological Mission in the Sahara (Tunisia, Algeria, Libya) project. His main interests cover the transitions from hunting and foraging to food production, the development of pastoralism in Northern Africa and the management of cultural heritage in arid regions. 16Michael Gervers is Professor of History at the University of Toronto and co-founder of Mäzgäbä Səəlat, an on-line corpus of over 65,000 images of Ethiopian art and culture. He publishes in the fields of medieval history, medieval art history and archaeology, and ancient textiles and ethnography. 17Pablo Gómez is Assistant Professor in the Department of Medical History and the Department of the History of Science at the University of Wisconsin, Madison. His work examines the history of medicine and corporeality in the early modern African and Iberian Atlantic worlds. 18Kyle Jackson is a Ph. D. candidate and Chancellor’s International Scholar at the University of Warwick’s Centre for the History of Medicine where he is exploring the history of health and religion in colonial Northeast India. 19Maja Kominko is a historian of late antiquity and Byzantium. Her research focuses on intellectual history. She held postdoctoral and academic positions at the University of York, Princeton University and the University of Oxford. She currently manages the cultural grants portfolio at the Arcadia Fund. 20Jane Landers is the Gertrude Conaway Vanderbilt Professor of History at Vanderbilt University. Her research focuses on Africans in the Atlantic World. 21Jane Lewisohn is a graduate of Pahalavi University, Shiraz, Iran. She has been involved in research into and promotion of various aspects of Persian Studies for the last three decades. Since 2005, she has been directing the Golha Project under the auspices of the British Library and the Music Department of SOAS, University of London. 22Elena Marushiakova (President of the Gypsy Lore Society) and Vesselin Popov have published widely on Roma (Gypsies) in Bulgaria, the Balkans and Eastern Europe. Their publications include Gypsies in the Ottoman Empire (2000) and the first monograph on Roma in Bulgaria (1997). 23Stephen Morey is Australian Research Council Future Fellow at the Centre for Research on Linguistic Diversity, La Trobe University. He is the author of two books on tribal languages in Assam, including both Tai-Kadai and Tibeto-Burman families. He is the co-Chair of the North East Indian Linguistics Society and has also written on the Aboriginal Languages of Victoria, Australia. 24Fallou Ngom is Associate Professor of Anthropology and Director of the African Language Program at Boston University. His current research interests include Ajami literatures — records of West African languages written in a modified Arabic script — and the interactions between African languages and non-African languages. 25Heleen Plaisier has written a comprehensive reference grammar of Lepcha, the language spoken by the indigenous tribal people of Darjeeling, Sikkim and Kalimpong. She is now working on a Lepcha-English dictionary. 26Irina Podgorny has been a Permanent Research Scholar at the CONICET (Consejo Nacional de Investigaciones Científicas y Técnicas) since 1995. She is also Director of the Archivo Histórico y Fotográfico at the Facultad de Ciencias Naturales y Museo of the Universidad Nacional de la Plata, Buenos Aires. 27José Trinidad Polo Acuña is Professor of History at the University of Cartagena and Director of the research group “Frontiers, Society and Culture in the Caribbean and Latin America”. 28Lisbet Rausing is co-founder of Arcadia, holds a doctorate in history from Harvard, and has taught at Harvard University and Imperial College. She currently serves on the advisory boards of the National Library of Israel and the Cambridge Conservation Initiative. 29Gabriela Ramos is Senior Lecturer in Latin American History at the University of Cambridge and a Fellow of Newnham College, Cambridge. She has published extensively on the history of religion in the Andes, including Death and Conversion in the Andes. Lima and Cuzco, 1532-1670 (2010), winner of the 2011 Howard F. Cline Prize for its contribution to the history of indigenous peoples in Latin America, Conference on Latin American History. 30Sophie Sarin is a designer who runs a textile and clothing studio in Djenné (www.malimali.org), as well as a hotel built out of mud (www.hoteldjennedjenno.com). 31Barry Supple is an economic historian. He held academic posts at Harvard Business School and at the Universities of Sussex, Oxford and Cambridge, where he was Professor of Economic History and Master of St. Catharine’s College. Subsequently, he was Director of the Leverhulme Trust (1993-2001). From 2001 to 2007 he acted as principal adviser of the Arcadia Fund. 32Jacek Tomaszewski is an art historian, conservator, and Lecturer at the Polish Institute of World Art Studies and the Asia and Pacific Museum in Warsaw. His main fields of research are the history of bookbinding, manuscript technology and book conservation. 33David Zeitlyn is Professor of Social Anthropology at the Institute of Social and Cultural Anthropology, University of Oxford and a Fellow of Wolfson College, Oxford. He has been working in Cameroon since 1985 and has published extensively on various topics including traditional religion, sociolinguistics, kinship and history. 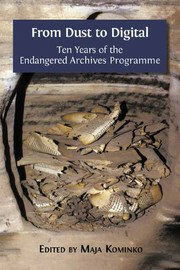 Notes on contributors In : From Dust to Digital : Ten Years of the Endangered Archives Programme [en ligne]. Cambridge : Open Book Publishers, 2015 (généré le 24 avril 2019). Disponible sur Internet : <http://books.openedition.org/obp/2207?nomobile=1>. ISBN : 9782821876262. Kominko, Maja, (dir..) “Notes on contributors”. Cambridge : Open Book Publishers, 2015. (pp. XXXI-XXXV) Web. <http://books.openedition.org/obp/2207?nomobile=1>.